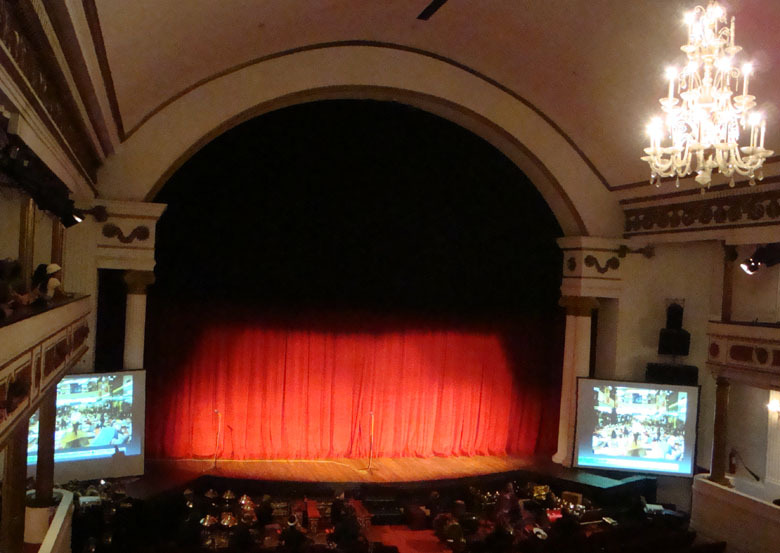 Last Saturday (21 January 2012), I had the chance to watch wayang orang (human wayang) performance in Gedung Kesenian Jakarta which was held by the Lions Clubs Indonesia District 307-A 1 . My friend, Iqbal, played as Petruk in this event. I was surprise and proud that he played in wayang 🙂 The title of the act was Babad Alas Wonomarto, and it’s divided into 7 acts. The act was using Javanese language. I know a little bit of Javanese language, well a little bit is still a little haha. 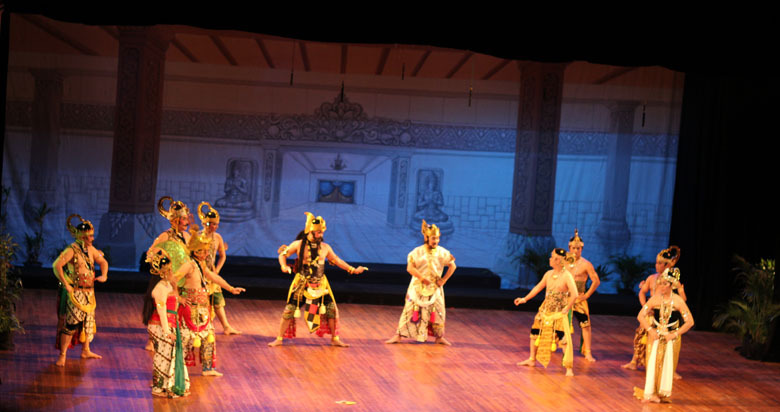 Javanese has several styles, depends on with whom you are talking too. If you talk with an older person, you should use Krama style; while if you talk with the person with the same age or younger than you, you can use Ngoko style. 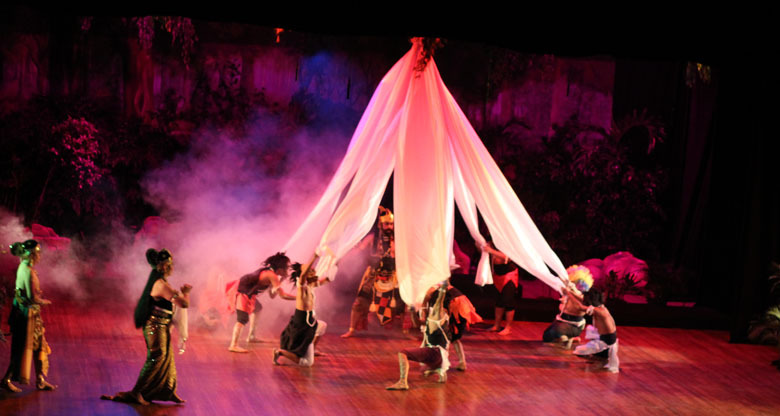 And the show used those styles, but luckily they’ve already put the explanation on the slide, so I could understand 🙂 The performers in this act were the professional performer of Wayang Orang Bharata, and Lions Club Indonesia District 307-A 1. 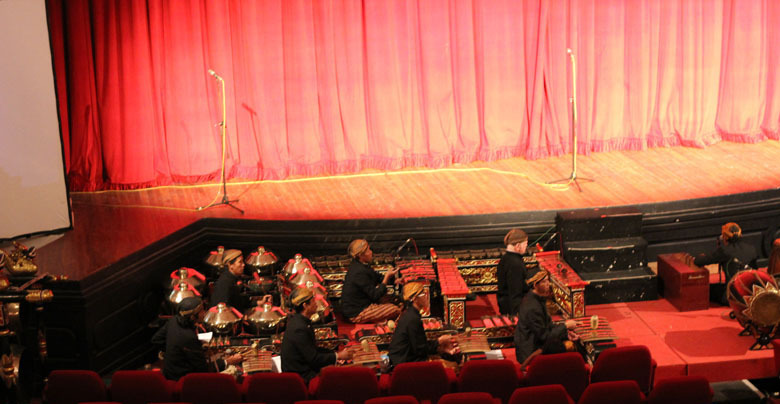 To support the act, there are some musicians using gamelan, a dhalang, and also pesindhen. 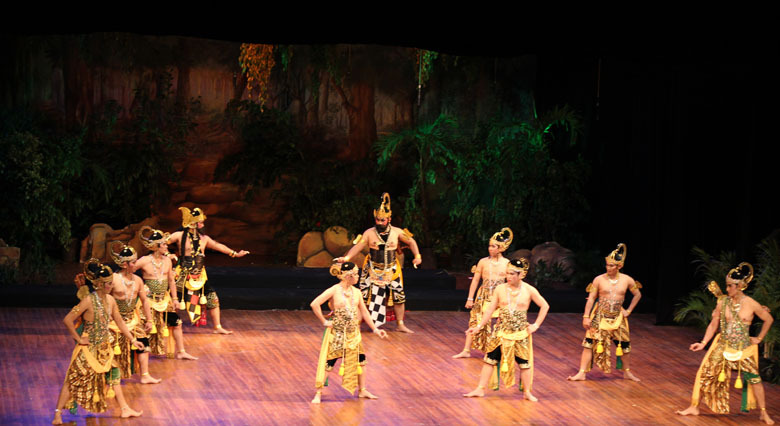 The purpose of the event was to remind us so that we protect the environment and preserve the culture of Indonesia. Brotoseno (also called Bimoseno) is on his way to meet his mother, Dewi Kunthi, and his brothers, the Pandhawa. In the forest, he encounters three evil brothers: Kencokorupo, Parupakenco, and Rojomolo. Brotoseno defeats them all. The Pandhawa family does not have a place to live after the murder attempt by the Kurawa. However, because the three evil brothers were defeated, they are given a place in the middle of the Wonomarto forest, the infamous forest resided by powerful demons. Brotoseno receives a task to prepare the forest to build a palace. He asks for his mother’s blessing and start the journey. (Missed the slide, sorry, so I just excerpt from the booklet that I got in the show). In the forest, Brotoseno is facing the giant trolls, wild forest animals, and demons. He lost the battle and is captured by them. Now, in the confinement, he can’t be seen with the mortal eyes. Here, my friend, Petruk, and the other plus a guest star, Nunung Srimulat, entertained us and also shared something about the Lions Club. Pamadi, Brotoseno’s brother, is attempting to find his brother and is heading to the Wonomarto forest. In the forest, he meets four Cakil giants who disturb him. He is able to defeat the four of them. Afterwards, an unknown figure appears and defeats Pamadi. Pamadi is then brought to the palace of Wilwuk. Wilwuk has a beautiful daughter who falls in love with Pamadi. They end up getting married. However, Pamadi is still upset because he has not been able to find his brother yet. To aid him in defeating the demons in the forest, Pamadi’s father-in-law gives him some relics. They are called Suket Ginting Kolonjono and Tirto Pranowo. They will enable Pamadi to see things that normal people can’t see. 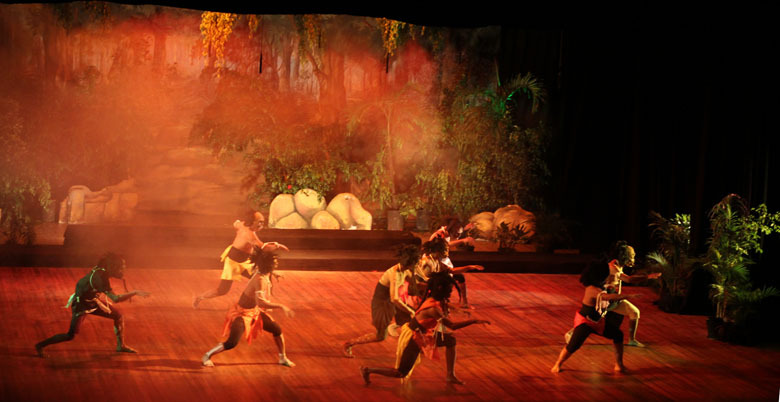 On his way to Wonomarto, Pamadi meets a group of muses who attempt to stop his journey. However, they are not able to stop Pamadi. Furthermore, they fall in love with Pamadi; they are willing to follow Pamadi everywhere he goes. One of them though, goes away and reports what has just happened to Yudhistira (one of the Punakawan brothers). In the forest, Brotoseno fails to defeat the demons. 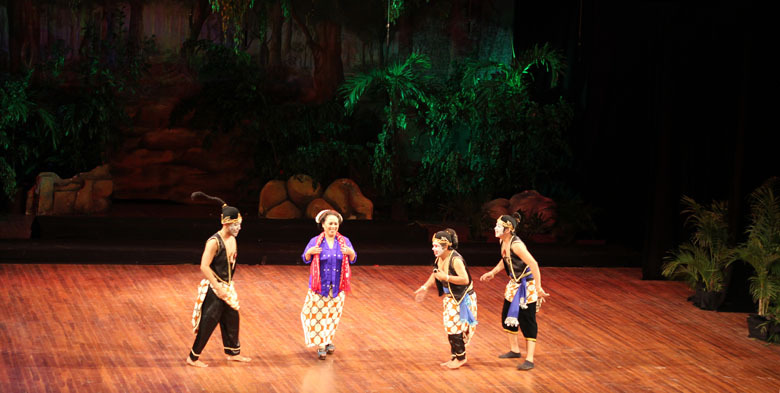 Dewi Kunthi and her sons come to the forest to look for Brotoseno. They are not able to see Brotoseno due to the power of the demons. Pamadi then rubs the relic Tirto Pranowoon on each of their faces. They are now able to see the trapped Brotoseno. Dewi Kunthi asks Pamadi to help Brotoseno. Pamadi releases his other relic, and soon the demons are all gone. The family then continues their journey. (I think I missed the first part 😛 … So again, from the booklet). Apparently, the Wonomarto forest is already resided by the demons with its king, Yudistira. He has four brothers, the Punakawan, who is look-alike to the Pandhawa. 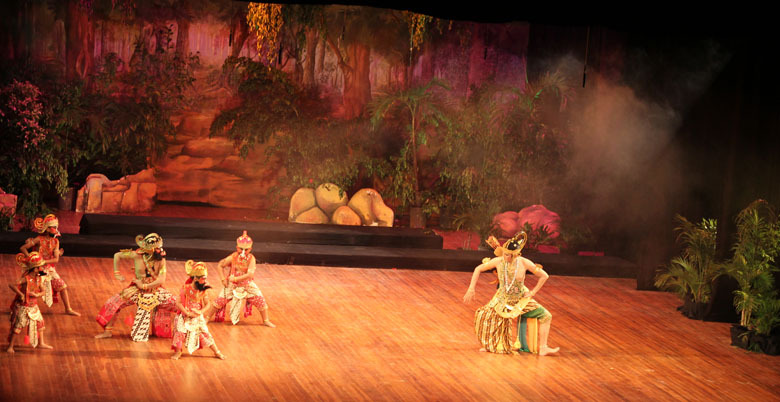 They doesn’t like the presence of Dewi Kunti and her sons in the forest. So the war happens between them. Whoever lost the war should pledge allegiance to the winning group. The Pandhawa wins the battle. Prabu Yudistira and his brothers, the Punakawan, also receive an omen from the gods; it is time to unite with humans who have high morality and wisdom, love mother-nature and are willing to serve those in need. The Pandawa who won the right to live in the forest is the sign. Ever since, the group of brothers is known as Pandawa Jatimulyo. At the end, the wise Pandawa rule their people, which also emphasize on preserving the nature. At the end, there’s a group photo with the director of tonight act, Daryanto Supono. 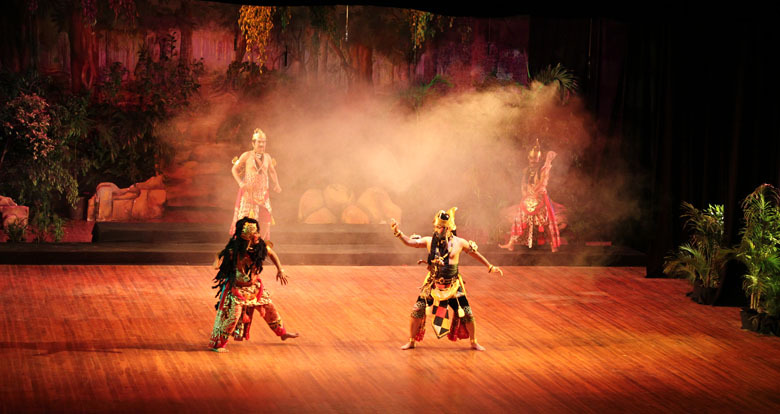 For more information about Wayang Orang Bharata, including the schedule of their performance, please visit their Facebook Page and follow their Twitter account: @wobharata. Bringing back my memory of Singapore ..
ada segmen2 siapa tanding siapa gitu? ?